This is the story of Clay Loft as told to Gai-Maree Cain. I am Clay and I am a proud Aboriginal and Torres Strait Islander man. Please understand, I can hear what you say and can comprehend; I see what is going on around me. Please don’t ignore me. When you walk into the room say hello. Look at me when you speak to me; I love to chat and I will let you know how I am. If I am happy or agree I will smile and laugh. If I don’t agree or don’t want to talk I will frown or not respond. I love having a laugh and a joke. To celebrate Reconciliation Week this year we had a morning tea at the Halwyn Centre. Brothers from the Aboriginal and Torres Strait Islander Health Unit came and we had a trivia event focused on Indigenous culture and facts. I love anything social, so I was there! Everyone got into teams. Gai-Maree the Nursing Director asked to be on my team because she thought I’d know the answers. I knew what she was up to! The questions started and Gai-Maree would ask me the answer. I said ‘yes’, ‘no’, ‘cricket’ and with each question I could see her excitement grow! Then time for answers, the quizmaster says: ‘no cheating’. Gai-Maree looked smug! Question 3 – The answer was ‘football’… we wrote ‘cricket’. I look over, Gai-Maree is frowning. I start to laugh. She knows she has been caught out. Ian won the quiz 16 questions right out of 20 and our team scored 2. I’m a very proud Aboriginal man and I knew all the answers, but the opportunity for a joke was there, I had to take it! I love watching sport, especially NRL and will never miss a Cowboys or Broncos match! It is even better when I get to go to a game. Halwyn. I missed Mum terribly, I am usually a very happy person but some days I felt down. I had my name on a waiting list for a home for years and last year I was offered the opportunity to move to a brand new home! Mum was so happy and we started the countdown to the move. In May this year, Lorna came to me and let me know I would be moving in late June. We had a date and I was so excited! Lorna worked really closely with me and mum… I never knew how exciting it was to have a brand new home. ‘Move’ I would say to everyone who stopped to talk to me. Lorna sat with me, I was upset not just for me but Mum. The following day was my birthday. Over the next few weeks I wasn’t myself, I smiled but those who knew me best looked into my eyes and knew the twinkle had gone… I was afraid that someone would tell me my home was no longer there. I tried to keep positive, and my Halwyn friends had a huge celebration morning tea for me. There were lots of laughs and a few tears but every day I was waiting for someone to say the home was not there. The day had come! On Monday 16 July I moved to my new home! It is at Logan, not far from Mum’s – the traditional owners of the land are the YuGum Bear people. I have my own unit in a house shared with three others. On 14 August we had a big house warming celebration. Mum came and I invited my friends from Halwyn – Roseanne, Pam and Lorna. They brought beautiful flowers for my unit and I gave the place a vacuum so it didn’t look like a bachelor pad. We had a huge morning tea and speeches. I even had a second piece of cake! As Lorna was leaving she asked me: ‘Clay, are you happy?’. I said ‘yes’. ‘Do you miss us?,’ I said ‘No… home’. Lorna knew I was home. 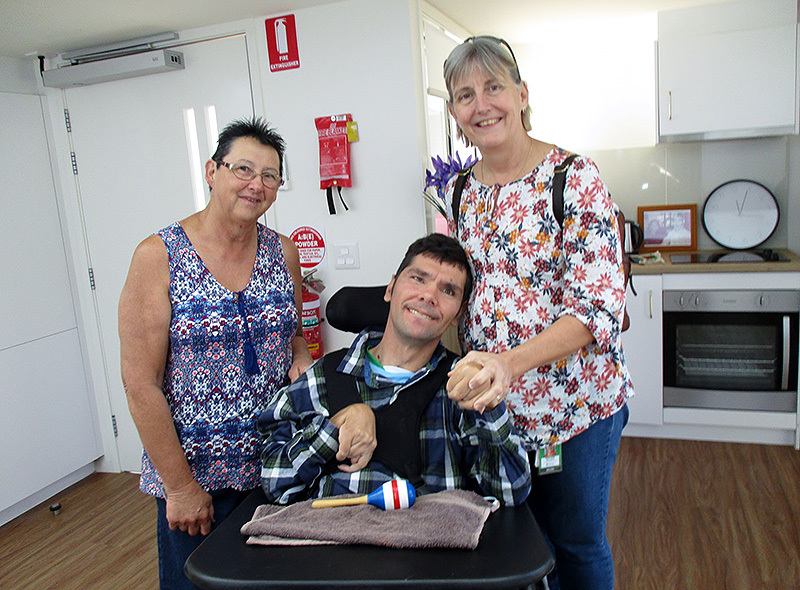 Everyone at the Halwyn Centre and across Metro North wish you the happiest times, Clay, in your new home.